Bitter Sweet Love is filled with all the "Bitter" (alochol) with "Sweet" (chocolate, sweets etc) Enjoy a relaxed social evening with us! Can you taste the chocolate sweetness in the air? Can you feel the love tonight? Valentine’s Day is a holiday commonly associated with couples. But, it started as a holiday to celebrate love, both romantic and platonic. 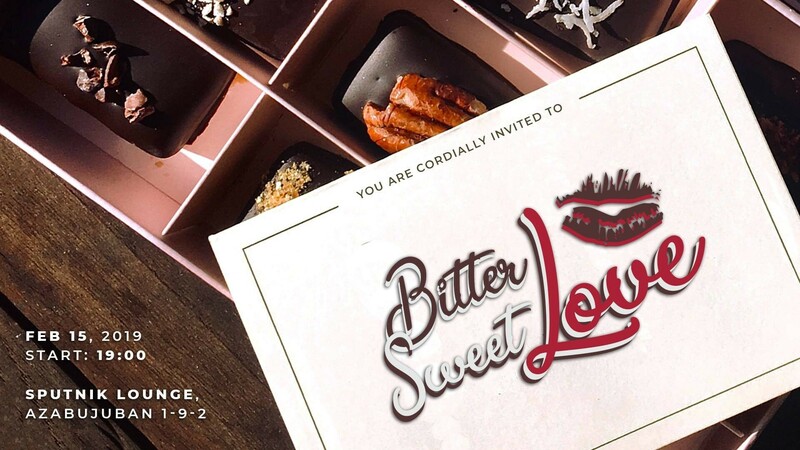 Bitter Sweet Love is an event that allows people to express their love not just for partners, friends or family, but also love for music, the arts, food, and drinks. Dress up and celebrate the bitter, the sweet and all elements of love with us at the beautiful Sputnik Lounge, a classy and avante-garde lounge located just one minute’s walk from Azabujuban station. バレンタインとはカップルで祝う日 のイメージがありますよね?しかし 元々はロマンティック、プラトニッ クな愛を祝う日です。そこで!今回 のイベント、「ビター・スイート・ ラブ」は恋人だけではなく、友達、 家族そして音楽、芸術、飲食への愛 を祝う場を設けます!麻布十番から 徒歩わずか1分にある美しく、上品 なSputnikラウンジで、私たちと若 い、甘い、ラブリーな夜を一緒に過 ごしませんか? Bitter Sweet Love is filled with all kinds of deliciousness: white, dark and milk chocolate, chocolate fountain, cakes and much more. Our sponsors will also be offering special, delicious cocktails at the bar. Enjoy a drink or two while indulging yourselves in live music performed by our amazingly talented singers and DJs. Download FLIP Nightlife Guide and get 1 extra drink! As the famous Forrest Gump once said: “Life is like a box of chocolates--you never know what you’re gonna get.” What will you get this Valentine’s Day? Bitter, sweet or bittersweet love? Come on down and find out!